An ice jam, or ice dam, happens when chunks of ice clump together to block the flow of a river. 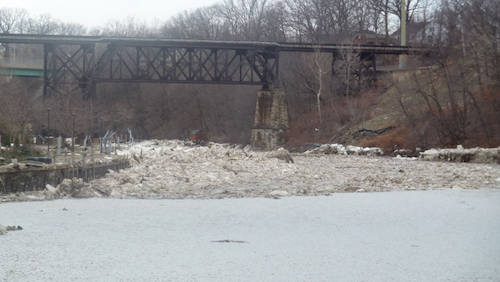 Ice jams are caused by melting snow and ice in the springtime. An ice jam, or ice dam, happens when chunks of ice clump together to block the flow of a river. This can cause flooding in communities near the river. Floods and droughts can be especially dangerous for the plants that make our food. A team of satellites, called the Joint Polar Satellite System—JPSS for short—is helping to monitor and forecast severe weather conditions on Earth. The more information that farmers have about conditions on Earth, the better they can react to weather disasters. Ice jams are caused by melting snow and ice in the springtime. Warm temperatures and spring rains cause snow and ice to melt very rapidly. All this extra water causes frozen rivers and streams to swell up, and the layer of ice on top of the river begins to break up. The rushing river carries large chunks of ice downstream, and sometimes a group of ice chunks get stuck in a narrow passage of the river. The ice chunks form an ice jam, which blocks the natural flow of the river. 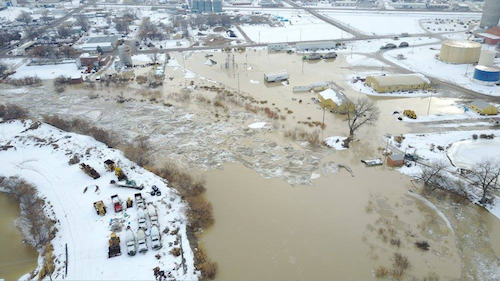 Ice jams can be dangerous for people living in towns nearby. Because the river is blocked, the rushing water has nowhere to go and it can cause flooding in the surrounding area. Where do ice jams happen? Ice jams can form almost anywhere that has winters cold enough for rivers to freeze—such as areas in the Northeast, the Midwest and Alaska. How can weather satellites help? Satellites in the Joint Polar Satellite System (JPSS) orbit the Earth from pole to pole, eventually seeing every part of our planet twice a day. One JPSS instrument, called the Visible Infrared Imaging Radiometer Suite (VIIRS), can capture images of surface water on Earth. Because JPSS passes over each location on Earth approximately every 12 hours, the data it collects can show how a flood is progressing and where flooding is the worst. This information can assist local emergency responders in figuring out which areas they’ll need to help first.